That’s the amount of time you have to grab your visitors’ attention on your website. 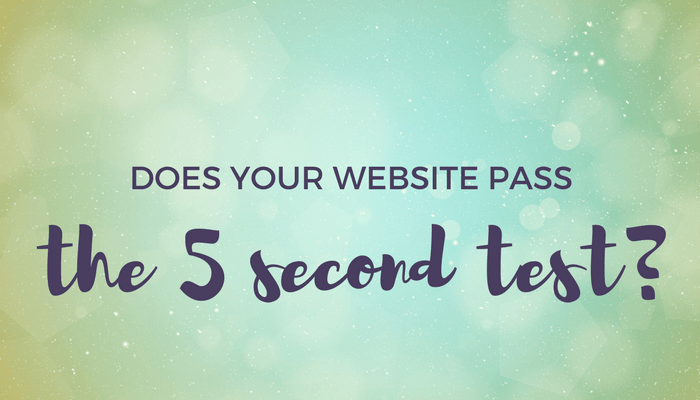 Can visitors grasp the purpose of your website in 5 seconds or less? Studies have shown that most people are surfing the web. They are clicking from one site to another, looking for a solution to their problem. With so many sites and so much information available, if it is not immediately clear what your site is about and how they’ll benefit from it, they’ll move on to your competition. It’s a test that’s used to assess the impact and clarity of a web page. To pass this test your website's visitors must be able to immediately understand what you do and what value you provide within a few seconds of their arrival. 1. Find a casual acquaintance who doesn’t know your business. 2. Let him or her look around your home page for 5 seconds. 3. Then shut the laptop and see if your friend can tell you exactly what you do and how you help them. If people who visit your website can’t answer those two questions quickly and easily, I guarantee you’re leaving money on the table.